Schalke 04 have increased their lead in the ​Bundesliga table over local rivals Borussia Dortmund thanks to a 2-0 victory in the Revierderby on Sunday - their first derby win since 2014. 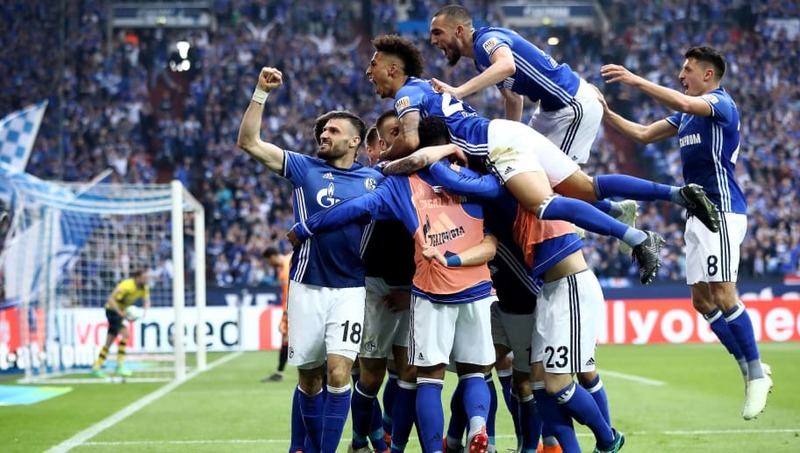 The Royal Blues were looking to bounce back quickly after suffering a shock defeat to Hamburger SV last week, and goals from Yevhen Konoplyanka and Naldo has all but confirmed that Domenico Tedesco's side will qualify for the Champions League next season. ​Dortmund still remain in the top four places with just four games left this campaign, but TSG Hoffenheim, Eintracht Frankfurt and RB Leipzig are all within touching distance in the race for European football. Hopes were high ahead of kick-off and most supporters expected to see an end to end match, with the frantic 4-4 draw between Dortmund and Schalke back in November still fresh in the memory of both sets of fans. A sloppy pass from Tilo Kehrer almost offered Christian Pulisic a chance within the first 40 seconds of the game, while Alessandro Schöpf forced Roman Bürki into an outstanding fingertip save after five minutes. Guido Burgstaller had a number of half chances over the course of the half as both sides continued to play on the front foot. Marco Reus tested the reactions of Ralf Fährmann with an audacious long-range free kick but Dortmund failed to create any clear chances throughout the first 45 minutes. Yevhen Konoplyanka was able to carve open one more chance before the break but his curling effort flew inches wide of Bürki's far post and both sides were level at half time. Despite failing to make their chances count in the first half, ​Schalke needed just four minutes to take the lead after the break. The Royal Blues' hard-working winger Daniel Caligiuri released Konoplyanka in yards of space and the Ukraine international strolled into the penalty area before firing a left-footed strike powerfully past Roman Bürki. Dortmund looked to respond quickly and despite keeping the hosts pegged back for a number of minutes, Peter Stöger's side quickly lost their momentum and Schalke regained the upper hand. Austrian striker Guido Burgstaller continued the threaten Dortmund's back line, with deep runs from Amine Harit and Leon Goretzka creating more opportunities by stretching the visitors' defence. Marco Reus had been a passenger for most of the game but he was able to test Ralf Fährmann once again with a left-footed effort from inside the area. The Germany international then teed up Christian Pulisic with a powerful cross but the 19-year-old was unable to direct his effort towards goal. Substitute André Schürrle threatened Schalke's defence throughout the second half but the former ​Chelsea forward was having little joy against the veteran centre back Naldo. And it was the hosts' resilient defending that allowed Tedesco's side to break forward on more than one occasion in the last few minutes of the game. After winning a late and seemingly innocuous free kick 25 yards away from goal, Naldo stepped up and fired a thunderous trademark free kick past Roman Bürki to ensure all three points stayed at the Veltins-Arena on Sunday. Dortmund continued to push for an equalising goal before the final whistle and they came close with Schürrle, but Schalke were able to hold on for a deserved win in the Revierderby, keeping their 12th clean sheet of the campaign.